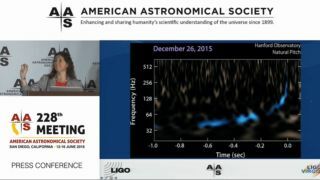 During a talk at the 228th meeting of the American Astronomical Society in San Diego on June 15, 2016, LIGO Collaboration spokeswoman Gabriela Gonzalez explains how she and her colleagues converted the signal of gravitational waves into sound waves. Scientists have added another song to the soundtrack of the universe. On Wednesday (June 15), researchers with the Laser Interferometer Gravitational-Wave Observatory (LIGO) announced that they had directly detected gravitational waves — ripples in the fabric of space-time predicted by Albert Einstein a century ago — for the second time ever. The LIGO team also made the first direct detection, which was announced in February. Back then, the researchers converted the gravitational-wave signal, which LIGO's two huge detectors in Louisiana and Washington state record as a light pattern, into sound waves. The result was a thump that sounded a lot like a heartbeat — or, in a frequency-shifted version, like a chirp, or a raindrop falling into a half-full bucket. The scientists also made the sonic conversion with this newly announced detection, giving people around the world a second helping of the sound of gravitational waves. You can hear it for yourself in this video. "This is what we call gravity's music," LIGO Scientific Collaboration spokeswoman Gabriela Gonzalez, a professor of physics and astronomy at Louisiana State University, said during a news conference Wednesday at the 228th meeting of the American Astronomical Society in San Diego. The two events were a bit different, so it's not surprising that their gravitational-wave signals differ as well. For example, the Dec. 25 sonic signal is quite a bit longer and more drawn-out. LIGO has made two gravitational-wave finds in relatively rapid succession, and a handful of other detectors are scheduled to come online in the near future. So we'll likely be hearing more versions of gravity's music in the months and years to come, scientists said. "The era of gravitational-wave astronomy has begun," Gonzalez said.